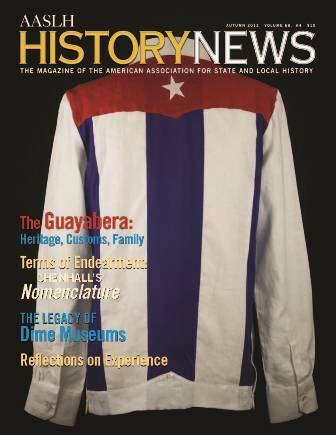 Drayton Hall Curator of Education Rikki Davenport recently published an article in History News, a magazine published by the American Association for State and Local History. Her article features the interesting history of the guayabera, a traditional shirt of Latin American and Caribbean cultures. Rikki Davenport has served as curator of education at Drayton Hall since 2007. Rikki is the Region 5 chair of AASLH’s National Leadership Team. Region 5 includes South Carolina, North Carolina, Virginia, West Virginia, and Kentucky. She is responsible for overseeing the state captains’ efforts to recruit nominations for the AASLH’s Awards of Merit, reviewing nominations within Region 5 to send on to the national level, and reviewing and voting on awards at the national level. Learn more about AASLH and how to submit a nomination for an Award of Merit at http://www.aaslh.org/. Click the image above to read Rikki’s article.